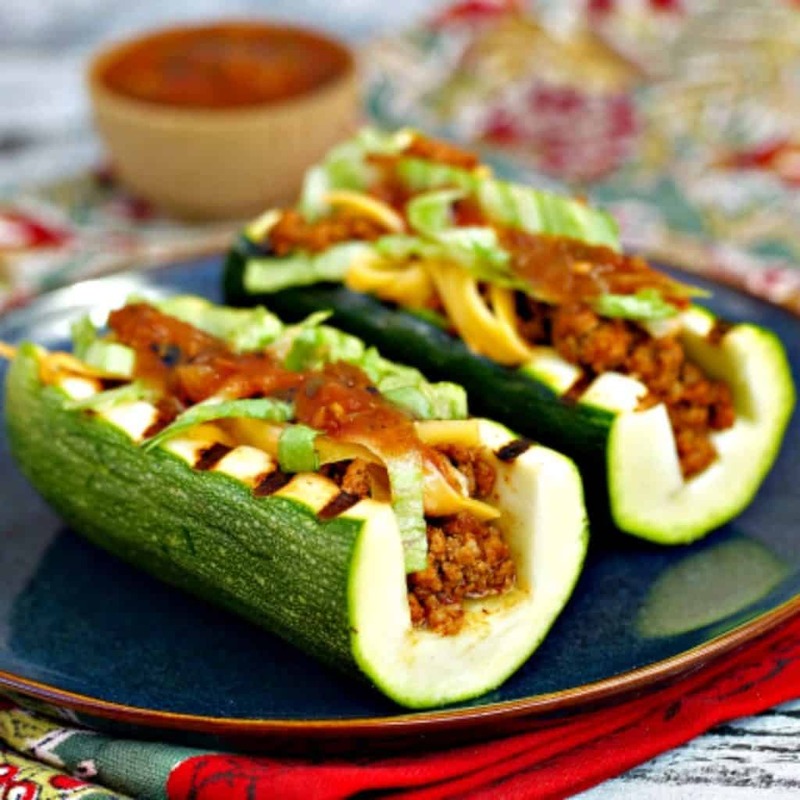 Taco Zucchini Boats are fun, healthy dinner idea, grilled zucchini filled with seasoned ground beef taco or turkey and topped with your favorite taco fillings like grated cheese, salsa, lettuce and fresh tomatoes—naturally low carb and keto friendly. I’ve got a fun and easy healthy dinner idea for you. My kids always loved it when I made zucchini boats for dinner only I used to fill them with Italian flavors. The light bulb went off in my head when I saw my sister’s Taco Zucchini Boats. I made these for my boys and they are a hit! 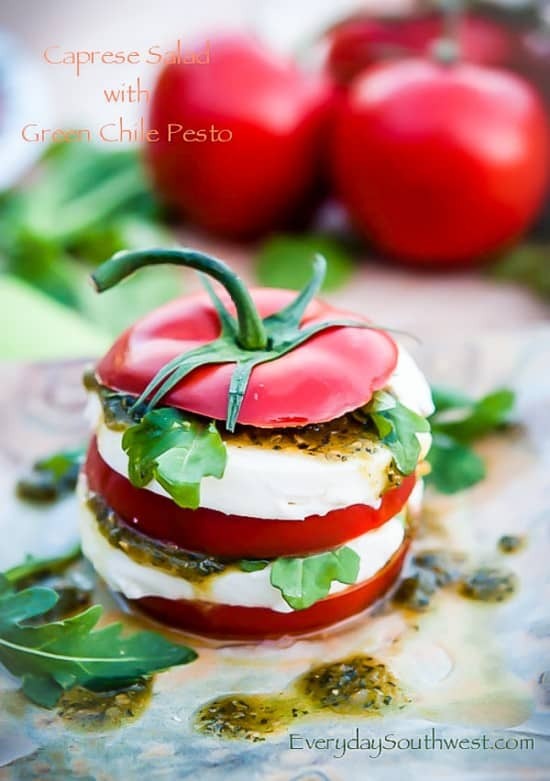 You will love the healthy, grilled flavor (I grill mine indoors on a grill pan). 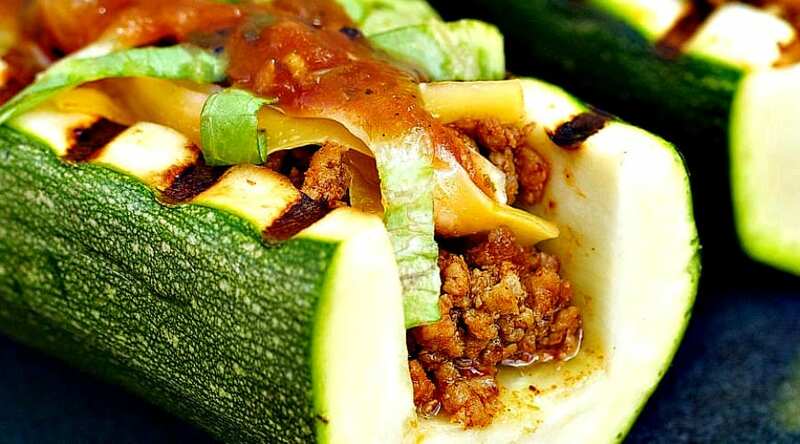 Your family will love their favorite taco flavors in a zucchini boat. Everyone has been asking me for keto friendly recipes. These Taco Zucchini Boats have been a favorite recipe of our friends and readers for years so, I have reposted the recipe with bigger pictures and an easy way to print out the recipe (our early recipes were written into the post and readers had to copy the down). Just scroll to the bottom of the post to find the recipe. Here is Donna’s original post plus a link to her new blog, ApronStringsBlog.com where she blogs with her daughter, Anne. Zucchini is the new tortilla! The most fun food event of the year just might be Sneak Some Zucchini onto Your Neighbor’s Porch Day which is coming up this Friday, August 8th. In the spirit of this event, I decided to think outside the shell – the taco shell, that is, and stuff hollowed out zucchini with taco filling. It really is a genius way to use up lots of zucchini in a very tasty way. Just slice some medium sized zucchini in half lengthwise and then use a spoon to scoop out the seedy part of the zucchini, making a space for the taco filling. The, just grill the zucchini until they are softened but not mushy and stuff them with your favorite taco fillings, or use my simple recipe below. Such a great, simple grill recipe that will surprise and impress your unsuspecting neighbors – sneaky or not! 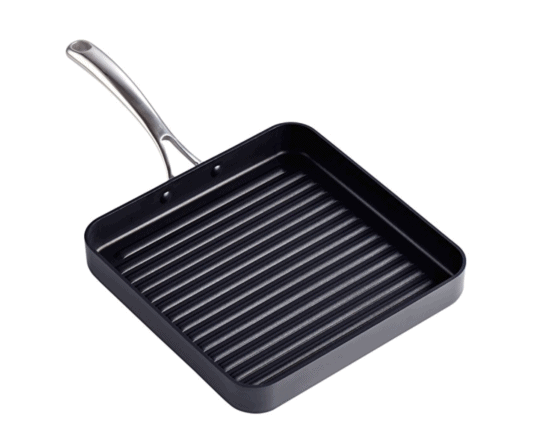 I use this grill pan for a quick and easy way to grill the zucchini boats but, any grill pan will work well. I hope you love this fun, healthy dinner idea—we do! If you have any questions, leave a comment on this post or leave a comment on Everyday Southwest’s Facebook Page. I LOVE hearing from your! 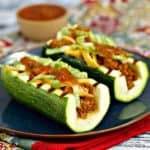 Taco Zucchini Boats filled with seasoned ground beef or turkey and topped with your favorite taco fillings. 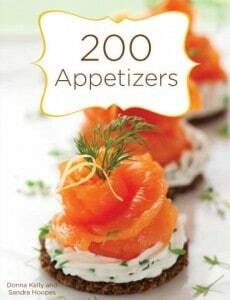 They are a fun and healthy dinner idea. Don't forget low carb and keto friendly! Cut zucchini in half width wise and then each piece in half lengthwise, making 8 zucchini “boats.” Placer zucchini over a medium hot grill and grill until zucchini is softened. In a skillet over medium high heat, cook onion in oil until softened. Add in cumin and chile powder and salt and cook for another minute or so, until fragrant. Add in turkey and cook until browned, breaking up into small pieces as you cook. Stir in tomato paste and remove from heat. 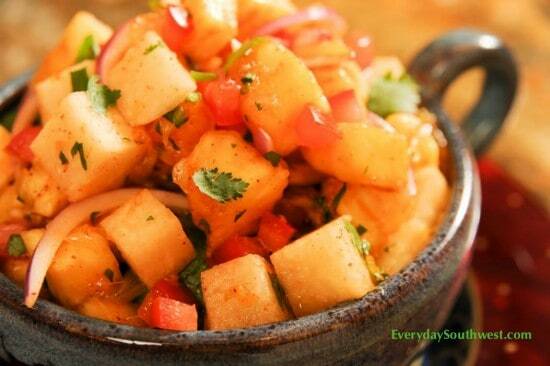 Fill cook zucchini with skillet mixture and top with desired taco toppings. This is a very clever idea! What a great recipe! This was perfect for us after a trip to the farmer’s market! I can’t believe that sneaking zucchini is actually a day. I want to be your neighbor. These sound delicious!